"A family favorite, this pie is a staple at all our gatherings! Its creamy apple center and crunchy sugar topping will thrill your taste buds." Whisk 3/4 cup brown sugar, 1 1/2 tablespoons flour, and salt together in a large bowl; whisk in sour cream, egg, and vanilla extract. Stir in apples; turn apple mixture into unbaked pie crust. Bake in the preheated oven for 10 minutes. Remove pie from oven; reduce oven temperature to 350 degrees F (175 degrees C). Place 1/2 cup flour, 1/2 cup brown sugar, cinnamon, and nutmeg in a bowl. 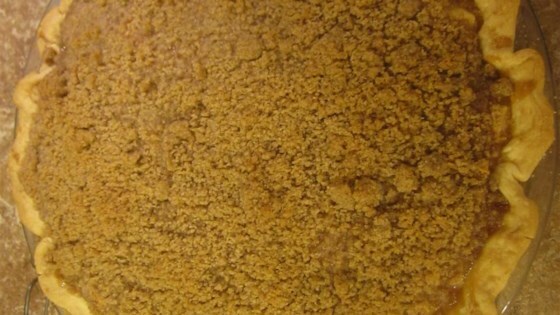 Cut in butter until mixture resembles coarse crumbs; sprinkle crumble topping evenly over pie. Bake pie until apples are tender, about 30 minutes. Cool before serving, about 30 minutes. Our family makes a version adapted to be diabetic friendly. We use 1/2 cup granulated brown sugar substitute (such as Splenda®) for 3/4 cup brown sugar in the pie filling, and 1/3 cup granulated brown sugar substitute (Splenda®) for 1/2 cup brown sugar in the topping.